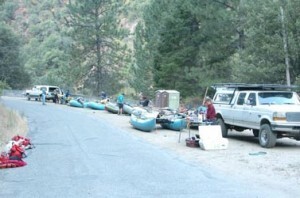 The benefits of going rafting with a commercial outfitter are many, including the fact that they take care of the details such as permits, shuttles, and meals. They also provide highly trained, incredibly skilled guides who know the river well. Running a private rafting trip on Cherry Creek is only recommended for expert groups. And it is always highly recommended that someone in your group know the river well and everyone have river safety training. If you do choose to tackle Cherry Creek on your own, here is information that will help you. during early and late season is a good idea. You can purchase permits in advance, or you can pick up a day-use permit the day of your trip. Permits for Cherry Creek (Upper T) are free, but you still need one. The Forest Service office is located about 1/4 mile past Casa Loma at 24545 Highway 120. You can call them at 209-962-7825. People rarely run intentional overnight trips on Cherry Creek. 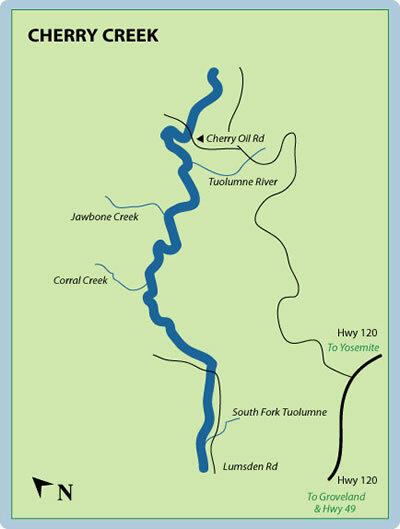 Some outfitters and private boaters link the Class V Cherry Creek section to the Class IV Main Tuolumne, making for a longer, more exciting trip. Generally, you would run Cherry Creek while they are rigging and getting everything set for the “T” trip, and you would meet them at Meral’s Pool and continue downstream. If you are doing a private Cherry Creek trip, you might be able to find a Main Tuolumne boater’s car to drive out from Meral’s Pool (take-out for you, put-in for them) and save both of you the extra shuttle time. somewhere between $50 and $100. The main meeting spot for Cherry Creek trips is at the old Casa Loma store, about 7 miles east of Groveland and 1/4 mile from the Forest Service office. You can leave cars at Casa Loma if necessary. From Groveland, head East on 120, past Casa Loma store, and take a left on Cherry Oil Road (just past the South Fork Tuolumne bridge). Go left at the sign to Holm Powerhouse and park at the turn-out next to Cherry Creek. From Groveland, take 120 East towards Yosemite about 7 miles. Take a left at the 2nd Ferretti Road (at the Casa Loma Store). Take a right on Lumsden Road. 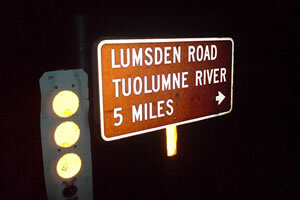 Lumsden Road is a one lane, dire road maintained by the Forest Service. It has been upgraded in the past few years, but a 4×4 is still handy. The drive down Lumsden takes about 35 minutes. Park your car on the side of the road at Meral’s Pool. Bathrooms are available at Meral’s Pool.